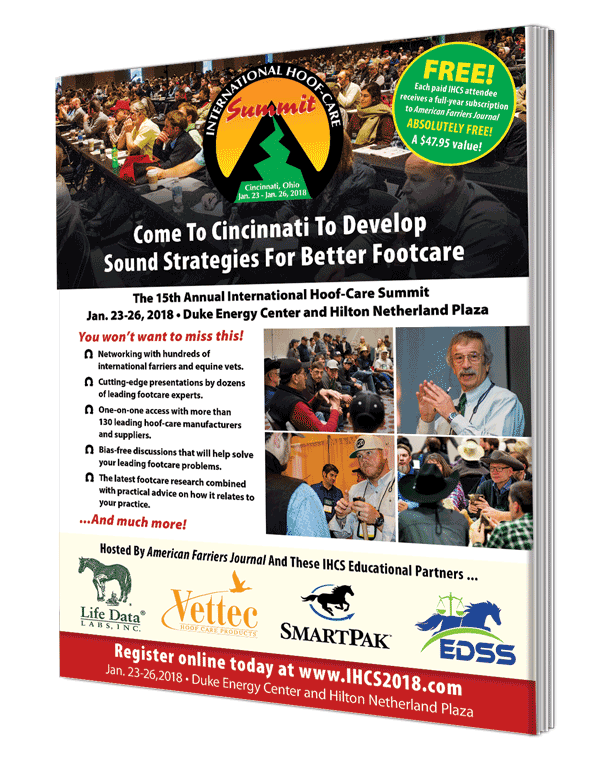 “Sound Strategies For Better Footcare,” the 2018 International Hoof-Care Summit theme, summarizes the reason farriers and veterinarians travel to Cincinnati, Ohio ..
“Sound Strategies For Better Footcare,” the 2018 International Hoof-Care Summit theme, summarizes the reason farriers and veterinarians travel to Cincinnati, Ohio, every year: to gain new and valuable ideas for improving equine hoof care..
Our 15th annual event offers unparalleled hoof-care education through 8 General Sessions, 15 Hoof-Care Classrooms, 24 Hoof-Care Roundtables and 12 “How-To” Clinics. In addition, attendees will have 9.5 uninterrupted hours to spend at the IHCS Trade Show, which will reveal 2018’s new footcare products, as well as those items farriers have come to rely on for years. While at the Summit, you can compare notes, discuss topics and learn from other farriers and vets from around the world. Among these speakers, exhibitors and attendees are some of the most innovative and forward-thinking footcare experts of today. Trade Show Sessions offering you the first look at 2018 products. Or download the registration form and fax or mail it back to the address/phone number provided. The Hilton Cincinnati Netherland Plaza at 35 W. 5th St. is the host hotel for the 2018 Summit. It is conveniently located just two blocks east of the Duke Energy Center. Book your room online or by calling (800) 445-8667 and mentioning the code “IHCS” to get the special room rate of $128 per night. The cutoff date to take advantage of the special Summit rate is January 1, 2018. Our 15th annual event offers unparalleled hoof-care education through 8 General Sessions, 15 Hoof-Care Classrooms, 24 Hoof-Care Roundtables and 12 “How-To” Clinics. In addition, attendees will have 9.5 uninterrupted hours to spend at the IHCS Trade Show, which will reveal 2018’s new footcare products, as well as those items farriers have come to rely on for years. View the program now. The 2018 Summit is approved for 27 CE credits by the American Association of Professional Farriers/ International Association of Professional Farriers. We’ve applied for veterinary CE hours. Please check back with us on the approval status. If you’re seeking a map of downtown Cincinnati and/or contact information for alternative parking lots outside of the hotels, download parking map. Transportation from Cincinnati/Northern Kentucky International Airport is available via Executive Transportation. Service desks are located in every terminal in the baggage claim area. Cost is $36 roundtrip or $24 one way. Reservations can be made via e-mail (prepay with a credit card or pay at the Executive Transportation desk at the airport) or call (800) 990-8841. You can also purchase tickets at the airport, but you may have to wait for the next available shuttle. Download and print a map of downtown Cincinnati for points of interest and things to do in the downtown area. View a list of restaurants and places to dine.